Stefanos Tsitsipas came of age to defeat two-time defending champion Roger Federer and reach his first Grand Slam quarter-final in thrilling fashion at the Australian Open. The 20-year-old recovered from losing the first set on a tiebreak, held off four set points in the second set and saved all 12 break points he faced through unrelenting determination in front of a captivated Melbourne crowd. Tsitsipas, who was facing Federer for the first time in a tour-level match, eventually knocked out the six-time winner 6-7 (11-13) 7-6 (7-3) 7-5 7-6 (7-5) after three hours and 45 minutes to become the first Greek man or woman to reach the last eight at a Grand Slam. The world No 15 will now meet another first-time Grand Slam quarter-finalist Roberto Bautista Agut after the Spaniard beat last year's runner-up Marin Cilic 6-7 (6-8) 6-3 6-2 4-6 6-4. "There's nothing really I can say to describe this," Tsitsipas said. "I'm the happiest man on earth right now." Federer was aiming for his third consecutive title at Melbourne Park but failed to take his chance to open a two-sets-to-love lead against one of the rising stars of the game in a gripping encounter of two similar game styles. "Roger is a legend of the sport, [I have] so much respect for him. He showed such good tennis over the years. I've been idolising him since the age of six," Tsitsipas, who was not born when Federer made his professional debut, added. "It was a dream come true just being on Rod Laver facing him. Winning at the end, I cannot describe it." The drama began in the opening game of the match as Tsitsipas was given two time violations, resulting in the loss of a first serve, but he saved two break points to stave off the threat of an immediate break. 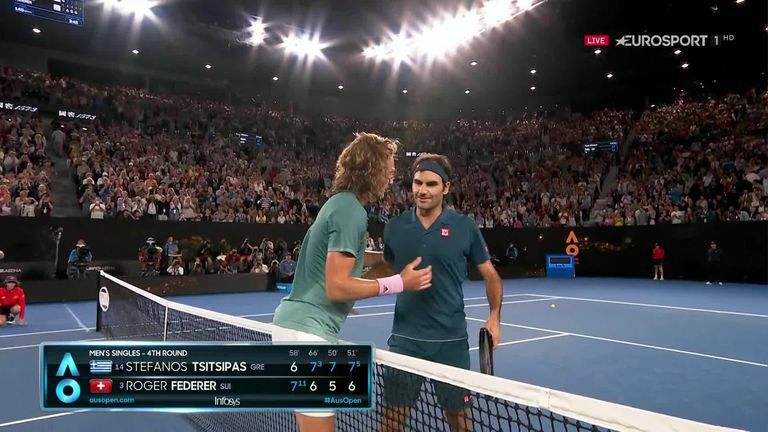 Tsitsipas showed no signs of nerves on the big stage and took the first set to a tiebreak but, at a crucial stage, appeared to lose his focus due to someone shouting from the crowd mid-rally and Federer ended up with the initiative. A similar pattern of serve dominating proceedings followed in the second set before Tsitsipas saved four break points across two extended service games and then a further four set points at 4-5 as Federer appeared on course to increase his command. Federer was made to rue those missed opportunities when Tsitsipas proved the more consistent player in the second tiebreak of the match, before he saved a further two opportunities midway through the third set. The Swiss had misfired off the forehand wing - targeted by Tsitsipas - and the 14th seed moved ahead for the first time in the match when, having earlier missed out on his first two break-point chances, sealed the third set against the serve. The Rod Laver Arena knew a huge story was unfolding and Tsitsipas, who called the trainer for a massage, refused to drop his levels, even under intense pressure from Federer, and secured a historic win following a third tense tiebreak.